We don’t need to get very elaborate to come up with a test that stresses properties. The app performs a meaningless but expensive computation and calls setNeedsDisplay as quickly as possible, up to the limit of how quickly iOS will redraw the display (120 frames per second). The computation is a for loop that performs floating point additions, so we can easily scale how expensive it is by adjusting the number of iterations in the for loop. To start, let’s investigate two different loops: one that accesses a property via the default getter and one that accesses an ivar directly. // Inner loop using properties. // Inner loop using instance variables. ; Inner loop using properties. Every time through the loop, we have to call objc_msgSend to call the property’s getter, move that result into the d16 register, and then perform the actual addition via vadd.f32, a NEON instruction (more on that later). 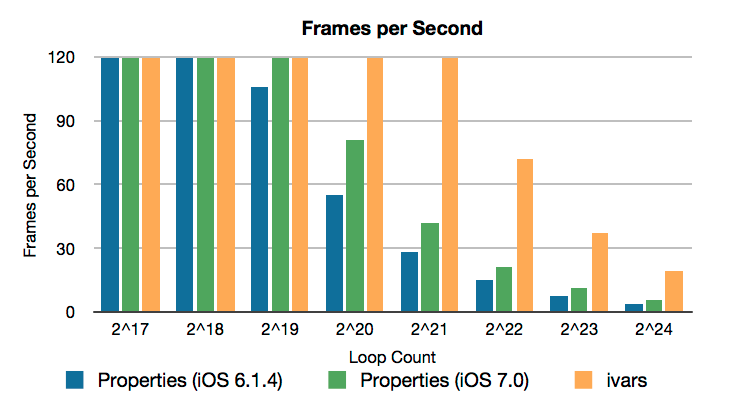 This disassembly did not change between the runs on iOS 6 and iOS 7, strongly suggesting that Apple sped up objc_msgSend, which by all accounts was already quite fast. This also lends even more weight to the performance mantra of “profile, don’t guess”—performance issues can change dramatically between different pieces of hardware (probably obvious) and between iOS updates even on the same hardware (perhaps less obvious). ; Inner loop using instance variables. In the ivar case, the compiler loads the current value of the ivar into the d0 register before entering the loop. It might come as a surprise that the compiler makes the assumption that the value of the ivar will not change while the loop is running. The short answer is that because the ivar is not declared as volatile, the compiler is free to “assume its value cannot be modified in unexpected ways”; for more details, see Compiler Optimization and the volatile Keyword at the ARM website. This pathological app is a lot of fun to play with, but it isn’t particularly accurate, since it’s tied to redrawing the display and all the myriad things associated with that. If we abandon the UI and focus on timing properties, we can get some pretty good information. 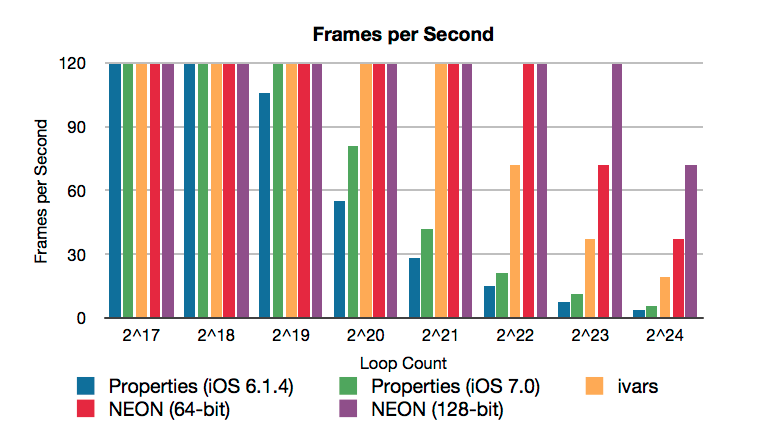 As with any timing information, there are a lot of caveats: measurements were taken on an iPhone 5 running iOS 7.0, and we were reading a single 32-bit float that was already in the L1 cache. Under these circumstances, reading directly via the ivar takes about 3 nanoseconds, and reading via the getter takes about 11 nanoseconds. Is it slower to use self.someOtherViewController instead of _someOtherViewController? Yeah, by about 8 nanoseconds. Using some tricks Mark D talked about with DTrace, we can provide some context. On iOS 7.0, that single line of code results in more than 800 calls to objc_msgSend, and by the time the other view controller has actually appeared on screen, the count jumps to more than 150,000. Think about that: counting objc_msgSend time alone, that single property access costs 1/800th of what it costs just to kick off the presentation of the view controller. It’s practically free, and because of that, the consistency of the code offered by using property accessors wins out. It’s time to stop worrying and embrace properties. Because it’s not really germane to the original question, we haven’t talked much about the actual addition happening in the inner loops of the sample app. The assembly instruction vadd.f32 is a NEON instruction. It takes two 64-bit NEON registers, treats them as each holding two 32-bit floating point numbers (in their top and bottom 32 bits), and performs two 32-bit additions simultaneously, storying the two 32-bit results into the top and bottom halves of a third 64-bit NEON register. However, in all the compiler-generated loops we’ve seen so far, we’re only performing a single addition in each iteration of the for loop—the other half of the vadd.f32 operation is being discarded at the end of the loop, so we’re wasting half our potential performance! // to the same value - 0.0f, in this case. // Note that we now increment by 2 since we're doing two adds on each pass. // Construct a pair of 32-bit floats, both initialized to our ivar. There is a tremendous amount of power tucked away in NEON. Most applications will never need it, but it’s nice to know it’s there.